Negotiation Support Systems (NSS) model the process of negotiation from basic template support to more sophisticated decision making support. The authors attempt to develop systems capable of decision support by suggesting possible solutions for the given dispute. Current Negotiation Support Systems primarily rely upon mathematical optimisation techniques and often ignore heuristics and other methods derived from practice. This chapter discusses the technology of several negotiation support systems in family law developed in their laboratory based on data collected and methods derived from practise. The chapter explores similarities and differences between systems the authors have created and demonstrates their latest development, AssetDivider. Alternative dispute resolution (ADR) is becoming a popular way of resolving disputes quickly, amicably and economically. We define ADR as any process considered an alternative to public dispute resolution, for example as an alternative to court battles. The different forms of ADR include Negotiation, Mediation and Arbitration. Negotiation is often between the disputants themselves; there is no third party whose role is to act as facilitator or umpire in the communications between the parties as they attempt to resolve their dispute (Astor & Chinkin, 2002). Mediation involves a third party neutral, known as the mediator, to assist parties in formulating their own resolution of the dispute. Arbitration is an adversarial process whereby an independent third party, after hearing submissions from the disputants, makes an award binding upon the parties. The arbitration process could be as close to judicial determination as one can get (Charlton, 2000). Negotiation can be described as an avenue by which social conflict is resolved. Negotiation is often the first method of dispute resolution that is called upon to resolve social conflicts. The non-violent nature of negotiation (if conducted properly) explains why negotiation is often preferred to harsher substitutes such as court trials or violent war. There are a number of theories to describe how people should negotiate; the two major being Positional and Principled negotiation. Positional Negotiation is based on the premise that one takes a position in a dispute and argues it. Occasionally concessions will be made in order to avoid a stalemate and ultimately any solution from the negotiation will reflect a win-lose (one disputant will win, while the other loses). Principled Negotiation, developed by the Harvard Negotiation Project, advocates proposing an argument based on the disputant‘s interests which support their position. It also promotes cooperation between disputants by advocating a joint search for options and objective criteria. Principled Negotiation is the most widely used negotiation theory in practise and as such we have used it as a basis to our research. Cooperative Negotiation describes the communication of parties when the outcomes are the result of coordinated behaviour of both participants (Robertson et al., 1990). Parties are more likely to be satisfied with (and most importantly adhere to) suggested solutions if they participated in reaching the solution. Whilst reaching a solution can indicate a successful negotiation, more important is how well the parties adhere to the solution. Our research is based on the assumption that disputing parties co-operate in negotiation, hence increasing the likelihood that solutions arrived by negotiation are successfully implemented. Our work has focused on supporting the negotiation process through technology. Otherwise known as Negotiation Support Systems (NSS), we have developed a number of computer systems to support the decision making aspect of negotiation. An emerging area within the realm of computerised alternative dispute resolution is On-line Dispute Resolution (ODR). ODR systems are web-enabled, primarily to provide parties who for various reasons cannot or should not meet face-to-face, with the opportunity to conduct negotiations and to facilitate easier and faster communication. We see Negotiation Support Systems as a subset of On-line Dispute Resolution systems, since negotiation is viewed as a type of dispute resolution. This chapter will also classify NSS by the type of decision making it offers and how it models negotiation support on computer. The following section outlines the systems in each of these classifications, and not surprisingly, we will find many will overlap across classifications. 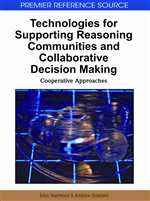 In line with the theme of this book, we will focus on NSS that specifically support decision making, whether that be by simply enabling disputants to communicate online to systems capable of proposing a solution to a dispute. Our review will not be limited to those providing support in Family Law (as there appears limited research outside our laboratory). We detail Principled Negotiation as our primary negotiation theory and link this with a thorough investigation of NSS developed in our laboratory. Following this, we discuss the development of our latest computer system, AssetDivider and conclude with a brief description of future work currently being explored in our laboratory.